Clean Gutters Protect Your Home And Roof From Additional Damage When It Rains! Here in Tennessee, we are subject to some pretty intense weather. From high winds to heavy rain, we get it all. While we always check for the most obvious damages, such as fallen branches and broken windows, when was the last time you took a good look at your roof? Everyone already knows that it is always a good idea to look for roof damage after a storm passed through, so you can address small damages before they become large damages. Many people, however, seem to pass over their gutters! Your gutters are a vital part of keeping your roof protected, and today we have some tips on how to keep your gutters in top shape! After heavy rain or wind, make sure your gutters are clear of debris. Also, walk along the perimeter of your home, and watch out for signs of leaking or rusting on your gutters. There may be areas that are sagging, or appear loose. For any of those signs, it is a good idea to call a professional roofer for assistance. Leaving these problems unattended can lead to serious problems that could affect your whole roof! If you, or your close neighbors, have trees in your yard, you likely have a significant amount of debris blown onto your roof. In order to protect your gutters from clogs, it is important to clear them of debris as soon as possible. 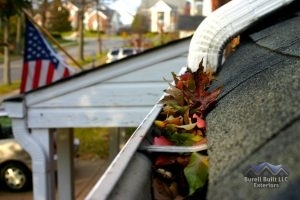 For some gutters, you can look into systems that prevent debris from falling into your gutters at all! While you clean your gutters, make sure you check and make sure that the spikes adhering your gutters to the roof and wall are still securely in place. If your gutters are securely attached, take the opportunity to flush your gutters with the garden hose, to remove any dirt or dust buildup. If you need help with your gutters, or with your roofing needs, give us a call at (865) 385-6926 today and schedule your appointment! We’re local, experienced, and happy to help! Posted in Uncategorized on July 6, 2017 at 1:58 pm by Burell Built Exteriors.